Can be eaten with sauce or used in stir-fry, sautés, soups, or ohitashi. This spinach was raised with care on designated farms and frozen separately for your convenience, so you can take out just the portion you need without needing to defrost the whole package. The spinach comes in easy-to-use ziplock bags. The leaf to stalk ratio is 7:3. 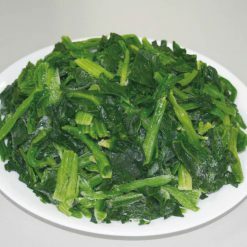 Many people avoid leafy greens like spinach because of the time required to prepare them, but with Sugarlady’s frozen spinach there is no washing, chopping, or even cleanup required – in fact, the spinach can be added frozen when cooking many dishes, including miso soup. Spinach is extremely versatile as an ingredient and can be used in all sorts of dishes from around the world, from Indian saag to Latin American sautés to Asian-style stir-fry. Not only that, but there are also many health benefits to adding spinach to your cooking. Spinach contains vitamins K and A, as well as manganese, folate, and magnesium. Sugarlady’s produce is harvested in season and then frozen immediately in order to ensure the highest possible nutritional value and best flavor. Without defrosting the package, take out the portion of spinach you will be using. Our spinach can be used frozen in sautés, miso soup, and other types of soup. Simply add the spinach when the sauté or soup is nearing completion and it will thaw to perfection with no worries about overcooking. Blanch the spinach lightly for ohitashi or to eat with other sauces. 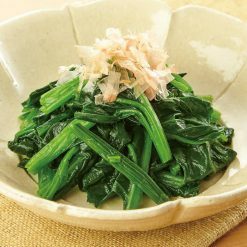 Ohitashi is a traditional Japanese dish comprised of spinach or other vegetables soaked in sauce. Our spinach can also be used in stir-fry, Indian saag, and many other recipes. This product contains spinach (China). The recommended shelf life for this product is 24 months. Origin of ingredients: spinach (China). Prepared and packaged in China.